10% Bonus When You Add Funds to Your Apple ID! Apple Apple: Get a 10% Bonus When You Add Funds to Your Apple ID 10% Bonus When You Add Funds to Your Apple ID! 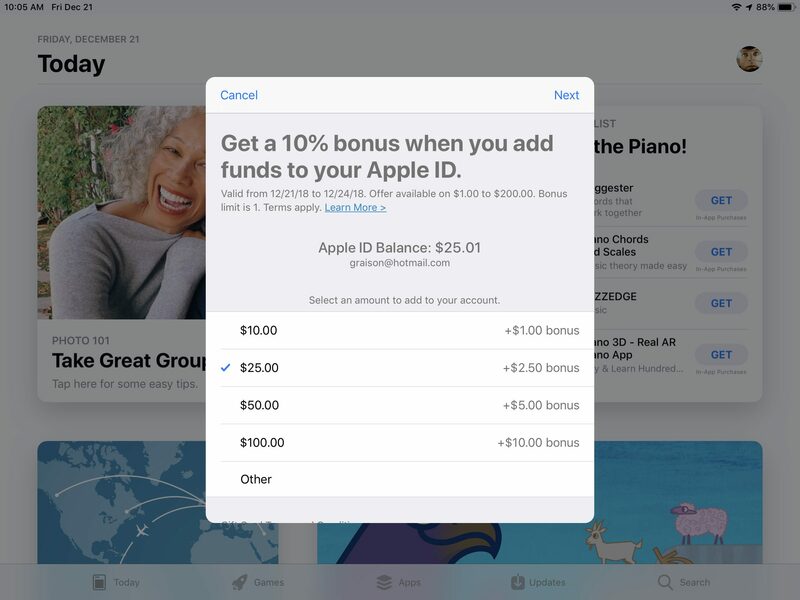 Get more funds for music, movies and apps with this offer from Apple, because you can get a 10% bonus when you add funds to your Apple ID! You can add up to $200.00 in funds to your Apple ID with an iPhone, iPad, iPod touch or through iTunes on Mac or PC -- click here to see steps on how to add funds on each device. Simply add your desired amount and the 10% bonus will be automatically added during your checkout -- for instance, you'll get a $1.00 when you add $10.00, $5.00 bonus with $50.00, $10.00 bonus with $100.00, etc. The funds are similar to iTunes & App Store Gift Cards and only usable with purchases through iTunes or the App Store, along with additional iCloud storage. This offer is available until December 24, with a limit of one bonus per Apple ID. Add funds for credit card or from gift cards? Looks like it adds from whatever payment method you have set up. 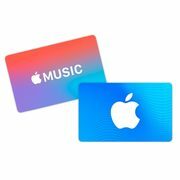 So if I just bought a bunce of iTunes gift cards, can I use them and get a 10% bonus when adding? Hard to say. This is the screen that mentions the bonus. The next one has me using Touch ID to confirm payment. Doesn’t say where it’s coming from though. 2nd that,,,,loaded a $50 card and no bonus. “Bonus limit is 1” so choose wisely. That's a shame you can't double up on promo iTunes cards from Costco, that would be hotter. That said I still have a ton of balance from my last iTunes card run.